As a member of the foodie group Shhhhh Cooking Secretly Challenge I have been participating in our current project of cooking from the cuisine of each of the States of India, in turn. 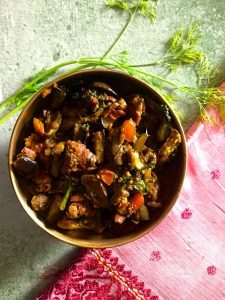 The theme for May 2018 was Himachal cuisine, so I sat down to search cook books and online references for a traditional Himachali dish to make. (More about how this group works, later on in this post.) 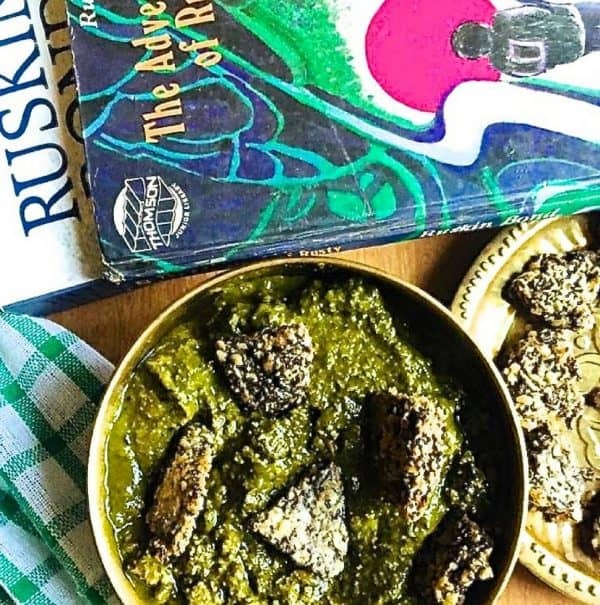 Though I have visited Himachal and enjoyed the food there, it is only when I read up for this post that I understood the sheer variety of dishes that make up its wonderful cuisine. One set of dishes are made for the traditional feasts called Dhams. You may like to read more about these in this article that I came across online: Himachali dham. 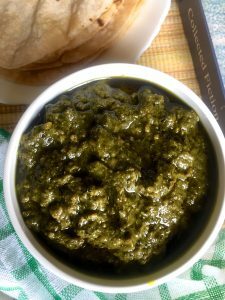 The split Urad dal Vadi in Spinach Gravy is similar to the popular palak paneer in appearance, but the taste is very different as several spices, including fennel with its distinctive flavour, are used in the spinach gravy as well as while making the vadi. This is the second time I have prepared a curry using fried lentil nuggets in a vegetable gravy. The first was when I made this awesome tasting Bihari Baingan Badi Sabzi. Let me tell you a little from what I learnt about the vadi for the split Urad dal Vadi in Spinach Gravy. 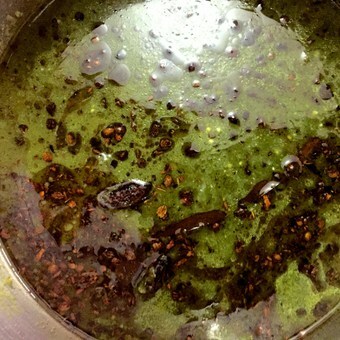 The badi (wadi/vadi) I made for the Baingan Badi Sabzi required the whole (sabut) urad dal (black gram dal) to be soaked overnight, ground to a batter and the little badis made from the batter to be sun dried and finally, fried and added to the curry. For this curry though, ie split Urad dal Vadi in Spinach Gravy, I used split black gram (split urad dal) lentils, soaked overnight, and then ground to a paste along with spices, steamed and then fried and added to the curry. A totally different method of preparation and of course, taste, though I must say both the badi and this vadi turned out delicious in their respective curries. 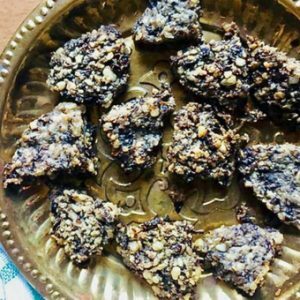 When you make the vadi or urad dal fritters according to this recipe, you may have some left over – store the fried vadis in an airtight container and use them in kadhi or or in a curry. I had fried the vadi in mustard oil, but if you are not used to the taste, you may substitute with a vegetable oil such as sunflower oil instead. Sesame oil, coconut oil and olive oil however, would not give you the authentic taste. The vadi may be made with white whole (sabut) urad dal, but I preferred this version with the split dal with skin on. The curry needs some time for preparation and cooking, including steaming the urad dal batter and deep frying the vadi in batches. 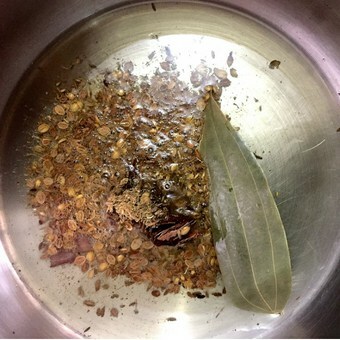 You may make the vadi a day or two earlier as that needs the maximum time. In earlier posts, I have talked about how the Shhhhh Cooking Secretly Challenge, works. Each of us is allotted another member as the partner for the month, and we give our partner the names of 2 ingredients, viz the secret ingredients, which will be suitable for the cuisine/theme for the month. 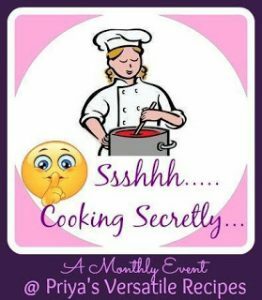 We plan the recipe for the month around the secret ingredients and of course fitting into the theme, and then make the item. We post an image of the prepared dish on the group, and all the other members try to guess what could be the 2 secret ingredients. Its not just fun and camaraderie, though there is plenty of that! For each theme, we get to explore cuisines which we may not be familiar with and read about cooking methods used in different regions of India as well as ingredients specific to that region. My partner for May is Shobana Vijay. 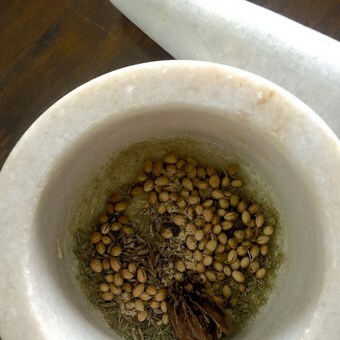 We exchanged ingredient names and I requested her to give me as the secret ingredients, cumin seeds and cardamom, which are used in a number of recipes of Himachali cuisine. This fit right into my split Urad dal Vadi in Spinach Gravy. Shobana blogs at ShobasDelight. 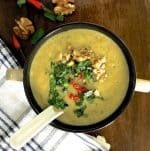 I found it a lovely site to browse, with a line up of several recipes including traditional Indian recipes using a variety of vegetables and with step by step instructions. Please do visit her blog, as well as check out the delicious looking Channa Madra that she made using the two secret ingredients I gave her: mustard oil and chickpeas. 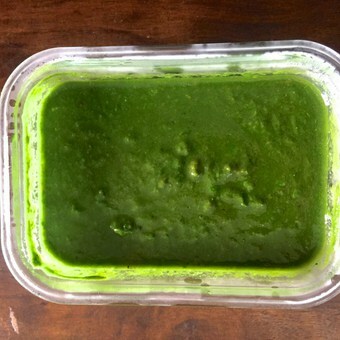 Traditional Himachali Sepu Vadi, split Urad dal vadi in spinach gravy. 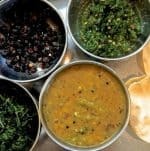 The vadi /lentil fritters are made from soaked, ground, steamed, split black gram dal, and then shaped, fried, added to a spinach and dill gravy cooked in spices. Enjoy the curry with roti, naan bread or with a simple rice dish such as jeera (cumin) rice. Spread the spiced urad dal batter on an idli plate or other steaming plate, cover and steam over boiling water for 15 minutes. Remove from steamer, spread on a plate keeping the thickness to about ½ cm and slice into small squares or rectangles (about an inch long) Allow to cool Heat ½ cup of oil and deep fry the vadi in batches. Drain and keep aside till required. To fry the vadi as above, you may find these timings useful: Heat the oil till it is smoking hot. Drop the pieces of batter one by one into the hot oil, taking care to leave some space between each ( and take care while working with hot oil!) Reduce the heat to low. After about 3 minutes, turn (flip) each one carefully with a spatula so that the bottom side is now up. Increase the heat to medium or high. Another 3 minutes, and then again turn the badis. Remove after 1 minute and place in a colander to drain. Heat the oil again for the next batch. Set aside till required. Time: 5 minutes to blanch and drain + 5 minutes to puree Cut away hard stems and dry or rotten leaves from the bunch of spinach. Chop and then wash the spinach well. Heat water in a pan until it is boiling, and add the chopped spinach. Cover the pan, turn off the stove and blanch the spinach for 3 minutes. Meanwhile prepare an ice bath by adding ice cubes to a a basin of water. Drain and quickly put the spinach into the ice bath and drain after 1 minute. Squeeze gently to remove excess water. The spinach will then retain its bright green colour. 2. Rinse and drain the dill, squeeze away excess water and chop it. Puree the spinach along with the other ingredients in the list above for Spinach puree ie the dill, ginger, chilli and spices, without adding water during the process. Set aside till required. Time: 5 minutes Pound all the spices as in the Ingredients list above for Spice mix, into a coarse powder. The Black cardamom needs only to be slightly crushed so that it opens up a little. Set aside till required. Heat the oil (see ingredients list for making Sepu Vadi above) in a medium sized pan. Add the bay leaf and then the crushed/pounded spice mix. Sauté for 1 minute Add the sliced tomatoes (if using) and sauté for 1 minute Add the turmeric and chilli powders, sauté for 30 seconds. Pour the spinach puree into the pan, stir and bring to a boil on high heat. Reduce heat and allow to simmer for 5 minutes. Add salt, stir. Add the fried urad dal fritters one by one into the gravy, about 8-10 small vadis should be enough for 1.5 cups of spinach puree without overcrowding the curry. Simmer the curry for 10 minutes, stirring frequently. Serve hot with a dash of lemon juice (if using), with hot rice or chapatis. Wow ! 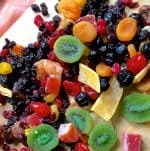 I love this recipe it is so unique. Bookmarking to try it. Looks delicious .. I like any dish made of spinach and this is going to be ‘must try’ dish. Thanks Anu! Yes and an advantage that it is nutritious too, so there is one more reason to make this one! 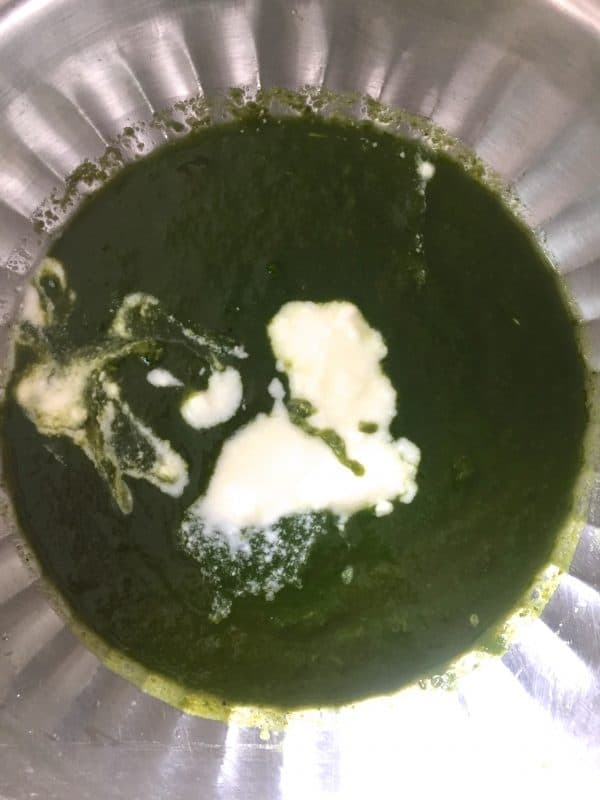 Loved the way you have explained the detailed recipe with making of Wadia from scratch .the whole recipe sounds elaborate but I am sure the final outcome is worth the efforts..wonderful share di ! Thank you Poonam! Its elaborate yes, but each of the steps are easy. Need to plan some time while doing it though.. Absolutely delicious curry and interesting.. very new to me. Will try sometime. Thank you Priya! Do let me know how it turns out! 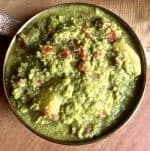 Such an ultimate dish, simply inviting and am sure this urad dal vadi in spinach gravy will definitely tickle my tastebuds.. Inviting dish there. Thank you Priya! So glad you liked the look of the recipe! Absolutely loved scrolling through the entire recipe and loved the idea of those urad dal badis from scratch. Excellent use of ingredients alloted to come up with such a wonderful recipe. As always, its a pleasure reading your posts and also seeing the books on the side of the dish. This one has Ruskin Bond for company. Hahah.. Great recipe and a great author as well. Cheers! Thank you so much Vidya. And yes, I cannot think of Himachal Pradesh without thinking of Ruskin Bond who has made these hills his home and given us such wonderful stories about the place! Well, he is my favourite too. Cheers! Thank you Renu, I hope you like it as much as I did! 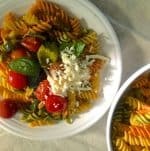 What a flavourful and nutritious dish that is, perfect as Low GI dish. Beautiful colour and flavours. I’d love to try out this unique sept vadi, it looks so delicious. Just got a little confused reading the recipe. The urad batter is steamed. Then you mention to spread it on a plate to a certain thickness. 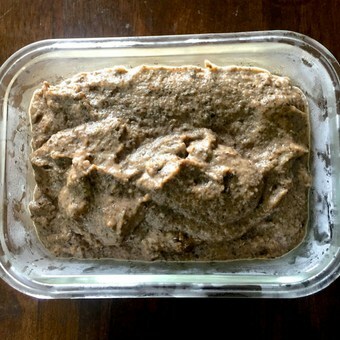 If the batter is steamed, it will set, so how do you spread it? Thanks Mayuri. To answer your query on the batter – the batter doesn’t set unless it is cooled. After steaming for about 15 mins, transfer it to a plate or even chopping board and spread it to the desired thickness, so that you can cut it into manageable pieces. I hope I have clarified but pl feel free to ask, if I haven’t.